The braided river can change every day depending on our environment.The artist noticed this every time she visited her grandparents at Lake Coleridge. The Rakaia River was always in a different place, height, or speed as if it was alive and had a choice of where it was going – she thought this concept was amazing. We have a choice every day to do the right thing, or not to, and that is what her signs are all about. Inspiration and choices that will determine outcomes. Katie Temple is 9 years old and attends Thorrington Primary School as a Year 5 student. She has recently taken on the leadership responsibility of Road Patrol, which she takes very seriously and loves that there can be two messages on each side of the ‘lollipop’ she carries as she helps children cross the road safely. This is where her idea has come from for the ‘stop’ and ‘go’ with the varying thoughts. 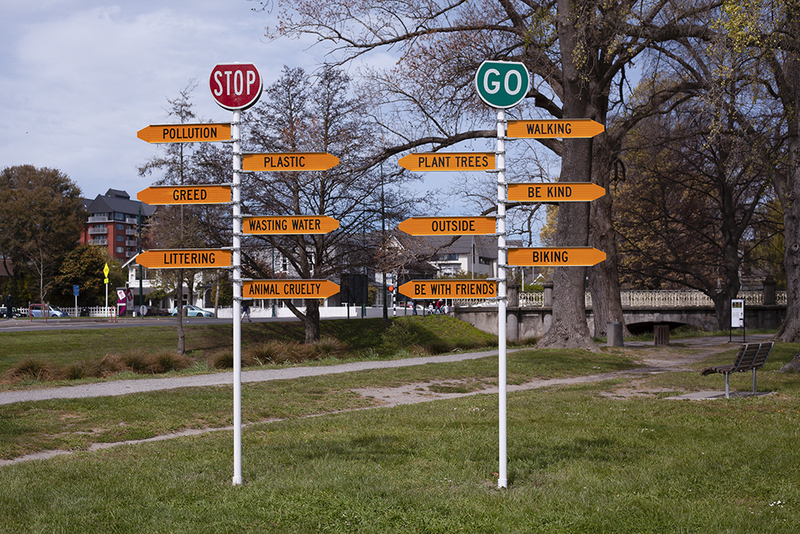 The artist is excited to have her artwork in Hagley Park, to get attention and provoke thoughts on all the subjects especially around the environment, people and animals of the world. Katie was selected from the Re:ACTIVATE Junior and Senior Aspiring Artists competition in June 2018 –an open call for young artists to submit ideas. The three winners' projects (Junior and Senior) have been built and displayed in Hagley Park as part of the SCAPE Season 2018.